Easter time is video time! During the holidays it might happens that we got some spear time, and what could be better than some old but good fights?! As usual we are not looking for the best knock outs when we choose videos. It might happen of course, but a really good fight do not necessarily have to end up with one of the fighter laying on the floor… but it could happen! That`s one of the Joker that makes it interesting..
We start of with an real classy fighter – well two of them in matter of fact, but the one more known than the other. As we saw Gábor Rózsa made his last appearance with several strong performances in 2017. In this fight he meet his fellow countryman Gál Csaba. These two fighters did meet more than this time, and both represented Hungary in several accessions. 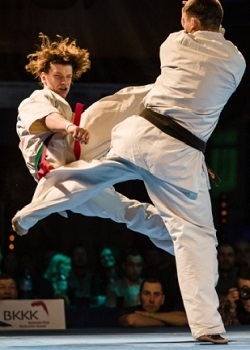 We really like the clean and powerful fight style..
European Championship in 2012, Belgium. The fight (in under 90 kg) between Maciej Mazur (Poland) and Valeri Dimitrov (Bulgaria) was the semi final. But since Edgard Sečinski (Lithuania) who was the second fighter ready for the final, could not fight in the final, this fight was the last one – and a kind of final that day in the under 90 category. Both are well known profiles now,but at the time Mazur was at his way up, and this become his first EC (senior) that he entered the podium. And as we know it was not the last! When it comes to Dimitrov, well this was far from the first time he entered the podium, it was the 10th time! Only weight category counted. So to Japan, and The 49th All Japan Open Karate Championship 4th round. This was held in 2007, and the fight between two young very skillful fighters with several merits. Kazuya Yamamoto vs. Yuki Maeda, both fighting with a very high pace, tactical and both with the surprising knock out techniques in their backhand. Kokoro Cup, Polish high standard tournament with elite fighters from all over the world. this was the 8th version, in 2014. This version had a very strong line up. Besides top fighters from Poland, Hungary, Japan, Kazakhstan and Lithuania was ready, last country with several fighters. In the final Ylya Yakovlev (Kazakhstan) met Justinas Kvietka (Lihtuania). Very different style of fighting, both had made it to the final – and a battle of the style was coming up. Now we go back, almost ten year, 2009 to the legendary Branco Bosniak Memorial tournament in Croatia. Both fighters are retired top fighters, “Mr Kyokushin” Gàbor Bùzàs, Hungary. (Victory Gym) vs Jimmie Collin, Sweden, Keiko. Both national team members of their country, and well known of each others strengths and tactics. Last one, Danish Open 2013, semifinal in lightweight division. Two fighters that know each other, not so strange since they both come from Sweden. The fight contend all what you need in a fight to think it is great to watch. Clean, very good fighting from two up and coming fighters, showing their full register of the technical aspect. This entry was posted in Steffens corner, Videos by Steffen. Bookmark the permalink.